This week the weekly geek site informed me that April 2nd was International Childrens Book Day. In celebration I thought I’d share Adam’s favourite books. When I was compiling the top ten I realised that the books I enjoyed reading to him were very different to the books he liked best, so I thought I’d compare the two! The Gruffalo is my favourite picture book. It’s rhyming verse is easy to read, the gruffalo is very endearing, and it has the cleverest plot I’ve seen in a book for young children. Adam enjoys listening to it, and loves the disgusting sounding food the mouse suggests – owl ice cream anyone? The only problem is that it is a little bit too long for him. I sometimes miss out a few pages so that he will sit through to the end. I think this will be perfect for him once he’s four or five. This morning he was feeling grumpy. He’d made the porridge and it was lumpy. then spilt the lot and burnt his knee. The plot is simple, but Adam finds a lot of it very funny. He has read it so many times that he can recite it. I highly recommend this book for three-year olds. This picture book is a must for all book lovers. It’s about a little boy that decides to eat books. He discovers that by doing so he learns everything that is inside them. In the end he realises that it is better to read them though! Adam is happy to read this, but never requests it. I think it is much more appreciated by the adult than the child, but if you get the chance you should have a quick read of this one, as I love it! 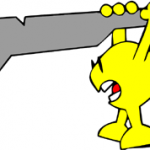 You’ve probably never heard of Whiff, but I don’t know why, as he should be a classic! Whiff finds it hard to find friends, as he smells and is surrounded by flies. These flies tickle everyone leading to all sorts of trouble, including Adam’s favourite – jelly and custard getting stuck to the ceiling! It flows nicely, is a great story, and makes toddlers laugh. If you’re after something new, then this book is a good choice. The Very Lazy Ladybird is another classic. It teaches young children about lots of different animals, and they love the sneezing pop-up at the end. Adam still enjoys reading it, although it is probably best for children under three. This non-fiction book on steam trains is my son’s favourite book by a long way. Published in 1978, it is packed with photos of trains from around the world. He spends hours comparing relative chimney sizes, the colour of traction rods and how many carriages each train is pulling. It bores me to tears, and it doesn’t matter how many times I hide it at the bottom of the pile – he always manages to find it! This large, bright board book is another favourite. Six plastic tug boats are visible through holes in the pages, and each one has it’s own page, explaining the job it is going to perform that day. Each tug boat has a name and my son want to know it, and why it is helping the tourists/going to the docks/helping the sail boat etc. I think this book is OK, but I don’t really understand his fascination with it. I have now read it so many times that I can recite it without the book! Adam loves all the Harry and the dinosaur books, but this is his favourite. They build a swamp in the garden using plants and pretend the hose is a snake. He thinks it is really funny, especially when they capture the snake in a basket. I quite enjoy it too. It is a nice gentle book, which is easy to read, and has the added benefit of explaining that it is not scary to go and play with new friends. 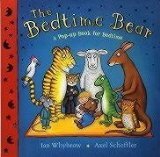 The Bedtime Bear is a very confusing book to read. There is no real plot; instead each page is crammed with little pictures, flaps to lift up and a few words to describe what is happening. Adam finds this book funnier than any other. He is literally crying with laughter when he reveals the skunk in the bunk or the wombat in a bath hat. I find it quite annoying to read, but it is worth it for the pleasure it gives him. This book has a very simple concept – basically each page consisits of animals sneezing. As the book progresses the animals and the sneezes get bigger. Children find it hilarious, but pretending to sneeze can only be fun for so long. I don’t like reading it more than two or three times a day, which unfortuanetly isn’t enough for my boys. Only buy this if you enjoy sneezing!!! Writing this list has just emphasized the differences between books that children love, and books that adults like to read to their children. I think it is important to read a wide range of books, but just remember to ensure that the children are getting to read books they really enjoy too! Do you agree with my ratings? Does your three-year-old agree? If you have a three-year-old girl I’d love to know her opinion of the books – do they like the same ones as the boys? Edited to add: See my new post on the Best Books for Four-year-old Boys. Our 3 and 5 year olds love the Gruffalo, too. The little one doesn’t really understand it all, but he still enjoys listening to it. Do you know the sequel “The Gruffalo’s child”? Also great! We got the book eating boy book from the library once. Our older son loved it. I thought it was a great little touch that a corner of the book cover was bitten out, . I have a 3 year old nephew so I will definitely check out these books for him. He loves the Scary McClary books and anything with horses in it usually! I also wanted to let you know that I have passed on an award to you at my blog. My little boy is three too! I haven’t heard of half of these, I’ll have to look into some of them. My boy loves anything to do with trains. By far his favorite is The Barnyard Dance by Sandra Boynton. He can not go to bed without reading it. Rikki – Yes – I love the Gruffalo’s Child too! It isn’t quite as good as the original, but is very clever. It went over my 3 year olds head more than the first one though. Adam loves the bit bitten out of The Book Eating Boy, although I have to admit that in the beginning he got a bit distressed that the book had a bit missing! Karen – I’ve heard of Scary McClary, but for some reason I thought it was for older children – I’ll have to go and see if the library have any of them. Thank you for the recommendation! Thank you for the award too! Natasha – I’ve never heard of Barnyard Dance. I had a quick look on Amazon and it looks great! Thank you for letting me know about it! I loved reading the comparison between mom and son. I found the same thing with my niece and nephews when they were little. Some of their favorites totally baffled me. Beth – It is really interesting isn’t it? I wonder what age reading tastes are established. My boys will proably grow up liking fantasy like their Dad, and avoid anything I recommend! My nephew is only two, but I love buying him books and am always looking into the future to see what is available for him. Gruffalo looks like such a fun book that I am going to have to look for it and purchase it to give it to him when he is closer to 3.
i am a reading addict and I am passing my addiction down to my grandchildren. I had to laugh when I read your son’s favorites. My kids and now my grandkids are the same way. Their sense of humor escapes me. Thanks for the list. I have an almost-four-year-old granddaughter who would love some of these. Kids often like the books that we like least. But reading with them is such a joy. Magic! I haven’t heard of most of those….must find them for my son (he’s only 18 months, though, and he doesn’t sit still for even a board book most nights). I have heard of the Gruffalo. Must find it! Valorie – The Gruffalo is a classic – every child should own a copy! I think you’re nephew will love it. What a great auntie you are! Judith – I’m sure your grandchildren will thank you for passing on the love of reading! It’s one of the greatest gifts there is! Margot – Children are so funny aren’t they?! The things they find funny are so different to adults. Kerrie – I agree – reading to children is great fun. Adam has got to the why? stage, so sometimes it can take me ages to read a book to him, as he needs to know everything about it! It is great fun! Rebecca – Your son will probably enjoy most of them at that age – my youngest is just a little older than your son, and although he doesn’t understand most of the words he loves looking at all the pictures. It won’t be long before he’s begging you to read the same book again and again! What a wonderful idea for a post! I’ve often thought about it, too, that my preferences don’t always mirror their own. My boys are 8, 6, and 1. Hm.. let me think..
My favourite ones to read to them are: Where the Wild Things Are, Kitten’s First Full Moon, The Giving Tree, and all Leo Lionni books. Their favourites are: Froggy Gets Dressed (and other Froggy books), the Pigeon books, and I’m Mighty and I’m Dirty. Our favourites that we agree on: Scaredy Squirrel, Harold and the Purple Crayon, Russell the Sheep, and any Dr Seuss (especially The Cat’s Quizzer!). I know you’ve recommended The Gruffalo before, and I intend to read them to my kids one day, I promise. Meanwhile, I’ll bookmark this post for future reference, thanks! I enjoyed your post so much. I have a three year old so I’m going to bookmark this page and come back to it before I hit the library next. I also love a good recommendation for Elliot. We go through so many books in our house! Elliot adores the Gruffalo and any of the other Julia Donaldson/Axel Scheffler books. E especially loves thr Duck series of books by Jez Alborough and I quite like reading them too..
Claire – How could I forget Dr Seuss?? You are right – I think I need to re-write everything to include The Cat in the Hat! I love reading it, and Adam finds it really funny – it is a must read for all children! I haven’t heard of any of your other favourites – I’ll have to take my ever increading list down to the library, and perhaps compose a new, completely revised list next month! Michelle – I like all the Julia Donaldson books too, but The Gruffalo is the best by a long way. I have to admit that I’m not a big fan of Tiddler though – the story is great, but I find it quite hard to read – it just doesn’t flow as well as it could. It’s great for teaching them about fish though! Can you believe I have kids and I’ve only ever heard of one of those before? I am definitely going to have to pick some of these up for my boys! Lahni – Don’t worry about not having heard of them before. Most of them are a bit obscure. I’m a book dealer so have hundreds of books through my house. These are not the best selling books for children (apart from The Gruffalo and The lazy Ladybird) but the ones which amused me and my boys the most. This is a great post! I have a 3 yr old niece and am always looking for new books to get her. Some of these sound really good. Melissa – I’m sure your niece will enjoy some of these books, although I’d avoid the train one! Maybe this explains why I have such a terrible time trying to pick out books as gifts! I don’t have any kids, but I loved to read as a kid. I’ve tried to pick out books for friends’ kids a few times, and I find myself absolutely baffled. I know what I would like, but I have no idea if they will like it. Dreamybee – picking books for children is really hard – I don’t think I’d know where to start if someone asked me to buy a book for a six-year-old girl. It’s just from reading to my boys everyday that I have built up a good picture of their favourites. I hope you manage to find some great books next time you have to buy some. Kerrie – thank you so much! I’ll try to post about it later today. I would also recommend We’re Going on a Bear Hunt by Michael Rosen and Helen Oxenburyand and The Enormous Potato by Aubrey Davis (Author, Narrator) and Dusan Petricic’s brilliant illustrations. My son love them. My almost 3 yr old boy LOVES books which he already knows well. 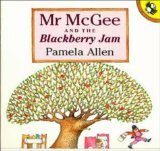 His current favs are: Mr McGee and The Big Bag of Bread, Mary Elizabeth’s House by Pamela Allen. The ones I hide are Emergency by Margaret Mayo, Dig and Dug, Down by the Station, The very Busy Spider, lots of factual books about vehicles and sharks, Disney books which are a poorly written summary of the movie, Thomas the Tank Engine and Bob the Builder. There have been others which I deliberately left in the doctor’s waiting room. The ones he won’t read probably don’t have a croc, shark, robot, dinosaur, racing car, steam train, digger or emergency vehicle in them. These include “I’m Not Cute” by Jonathan Allen (my other son loved this), Harriet, You’ll Drive Me Wild by Mem Fox (I Need to read this aloud to someone to stay sane), Handa’s Surprise (it’s even short. And it has a monkey.Come On! ), Drac and the Gremlin (None of my kids liked this but I love it). 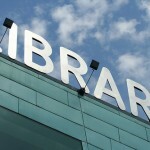 Penny, Thank you for commenting on my blog for the first time and for the very helpful list! “The Troll” Julia Donaldson possibly because the story includes pirates he especially loves reading the page where the troll is made to walk the plank. “The Pirate Cruncher” Jonny Duddle I cant recommend this book enough for little boys who love pirates. The book is beautifully illustrated and every time we read it there is something new to discover. Karen, Thanks for the hints. The Troll is one of the few Julia Donaldson books that I haven’t read yet. I think they are all wonderful and I’ll have to see if I can find a copy in the library. I am a nanny to 3 year old twin boys so I wrote down all the books you listed to make a trip to the library. I started going to the library every few weeks for them because I COULD NOT read Curious George Goes to the Hospital one more time. They picked that one every day! But if I have new books from the library, they just want to read those. I am always glad to have suggestions as it is takes me too long to skim books without a list. I’ll let you know next week which if we rate it the same as you! I searched out The Gruffalo and it became an instant obsession for my son. I came back here to see what else I should look out for at the library. He also wants to read anything about dinosaurs, but i keep putting those at the bottom of the pile. Dinosaur Encore by Patricia Mullins is good. Penny, I’m so pleased that your son enjoyed The Gruffalo. My boys also enjoy Green Eggs and Ham, I’m Not Cute and Little Robots. I haven’t come across the others you mention. Some may be a bit old for him, but there is a lot of overlap at this age, so hopefully you’ll find a few good new suggestions there too.